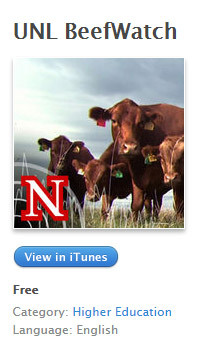 The BeefWatch Podcast is an audio companion to the UNL BeefWatch newsletter. It provides the same timely information as the newsletter, just in a downloadable audio form. Information is geared to helping beef cattle producers improve the sustainability and profitability of their operations. As a busy rancher, you have limited time to spend reading. You often have time available to listen while in the pickup or tractor cab. The BeefWatch Podcast brings you the information you need in a format you can use. Don't miss any episodes. Once you subscribe, every podcast will be delivered straight to your computer, phone, or other device of choice. There are two sources where you can access the podcasts: iTunes or Feedburner. Use this link to subscribe in iTunes. iPhones, iPads and many Android podcast apps allow you to search iTunes. Simply type BeefWatch into the search box of your favorite podcast app. Use this link for Feedburner. Alternatively you can copy and paste this URL into your podcast app. Once you've found the BeefWatch Podcast, click "subscribe," and new episodes will automatically be added to your device. To subscribe directly to the podcast on your phone, open your favorite podcast app and search for "UNL BeefWatch". If you are having trouble subscribing, take moment and watch one of these brief tutorial videos.